Earlier this year, Spanish team G2 Esports welcomed Lindsey Eckhouse and Sabrina Ratih to the organisation. With a growing female presence now pulsing through a mostly male-dominated industry, it’s only natural that they want to make a significant impact on G2 Esports. Bringing their knowledge and experience to the fight, they’ve taken on massive roles in the company’s management to support the partnerships department, marketing and the commercial direction of the team. We caught up with Lindsey and Sabrina to find out about their new roles and working in a male-dominated environment. Esports Insider: With both of you securing positions such as Commercial Director and Partnership Executive, it’s easy for us to get lost in titles and technicalities. What does your work entail? Lindsey: As Commercial Director, I ultimately lead the non-gaming based revenue streams for the Club, which includes tournament and league revenues, media licensing, consumer products and sponsorship businesses. I focus on building a robust merchandising business which encompasses getting G2 gear into the hands of fans, managing our tournament/ league relationships, our commercial and brand partners, and in identifying new formats for the team to license its assets to grow our fan base further, brand profile and ultimately revenue. The day-to-day is extremely varied and fast-paced. I focus on everything from solving partner challenges and building new assets, to identifying new revenue streams. I feel fortunate to work with incredibly talented and hard-working colleagues where we all push one another to be the best and are trying to help the Club become the best in the world. Sabrina: I am supporting G2 Esports in all business development and partnership matters. My work entails shaping the partnership inventory, translating assets into meaningful propositions for our partners, closing new agreements and setting up new revenue streams. By strengthening our partner portfolio, especially in the area of non-endemic brands, my ultimate goals are to strengthen the reach and engagement of G2 Esports globally, establish G2 Esports as a Media brand and lastly, build long-term relationships with our partners & commercialise our assets in the best way possible. ESI: You both bring an impressive resume to the table; senior alumni of Red Bull and the NFL. How does your previous experience allow you to flourish in this particular role? Lindsey: The NFL is arguably one of the biggest sports brands in the world. From rights delineation and innovative data partnerships, to deal with architecture, I am hopeful that I can further propagate the successes the team has already realised, and identify new opportunities to grow the business even further. Sabrina: I might be biased, but I believe Red Bull is one of the best storytellers globally. For me, creating partnerships is about telling authentic and engaging stories that resonate with our audience and the audience of our brand partner. I love to find the strategic sweet spot that makes both brands click. I hope that my expertise in a brand turned publisher environment, combined with my knowledge of forming strategic global agreements and orchestrating cross­-functional teams will help G2 grow their partnerships and cement themselves as the leading esports entertainment asset. ESI: Coming from male-dominated working backgrounds, what are you views on female presence within esports and will we see more equality in the sector? 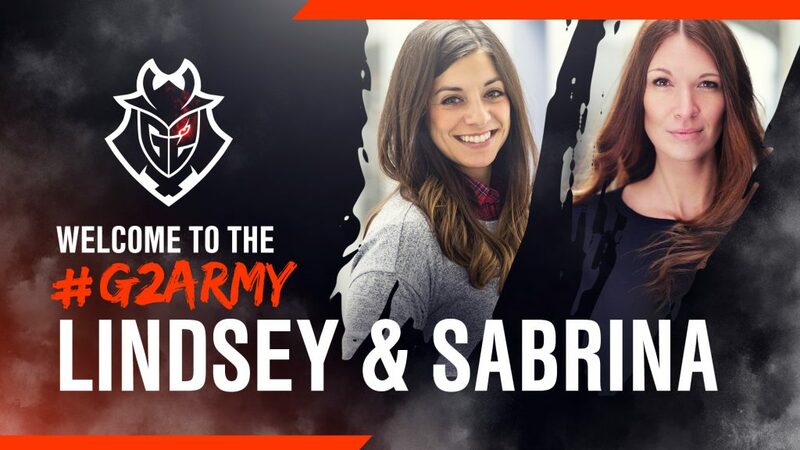 Lindsey: I think esports, in general, is already diverse in many ways – but there is always a need for more diversity, and a need for women in leadership positions to support those that are interested in getting into the industry or rising within it. I am a big believer in hiring the best person for the job regardless of gender or background, but I still get excited when I see women leaning into this world, particularly in a commercial function. Sabrina: There certainly is still a lot of work to do in levelling out inequalities and tearing down stereotypes, but I constantly catch myself focusing on the positives, from companies like SOHO House publishing a gender pay gap report and working to minimise the pay gap year over year, to seeing women in various industries serving as strong leaders. In my own life, I see so many success stories. The more we focus on those stories, the better we drive the change. ESI: Why is this diversity so vital and how do you think we can improve on that in the future? Lindsey: Diversity offers different perspectives that can help bring fresh ideas and thinking into organisations. It is extremely important to celebrate differences and, in my mind, assist in supporting these voices. To improve this, I think companies should endeavour to bring in different people from different backgrounds and consciously work towards promoting and hiring those who challenge the status quo, think differently, and add value versus those who are from a similar background or have a similar point of view to the manager. True growth occurs when people can bring their unique perspectives to the table. Sabrina: Bringing in people with different backgrounds and personalities means nurturing innovation, inspiration and a multitude of different points of views. In the future, we need to celebrate our unique traits even more, rather than letting others try to tame them in order to fit into corporate structures. ESI: What is it that you’d like to bring to G2 and what impact would you like to have on the company overall? Lindsey: My goal is to build a strong commercial program that helps the Club evolve into more than an esports team, but into a gaming and entertainment brand. Sabrina: My goal is to support G2 when it comes to using partnerships as a vehicle to build additional consumer touch-points, tell engaging stories and continue to strengthen its unique positioning in the market. I would also like to educate the market on the sheer amount of partnership inventory a multi-team club like G2 has to offer. If you look at last year, G2 attended more than 130 tournaments both online and offline. And that’s just one part of the inventory. By having direct access to the teams and players, we can create bespoke partnership programs that are precisely tailored to the needs of our partners. ESI: What fuelled your passion at the beginning of your careers and how would you encourage others to follow suit? Lindsey: At the beginning of my career, I had a real thirst for learning, networking and challenging myself. The further I get in my career, the more I notice that this hasn’t actually changed. I continue to be curious, meet amazing people, and find ways to challenge myself. I would encourage everyone to do the same — you would be surprised where that takes you. Sabrina: I always set yearly goals. I pushed each of my line managers year on year to give me new growth opportunities. I encourage everyone to do the same; no one is better in shaping your own career than yourself.